There’s more to Minnesota films than strong Brainerd accents and Prince taking over First Ave—even though we undoubtedly take pride in both. Often what gets your MN pride going are the subtle and often overlooked places and faces. While feature films often choose MN landmarks such as First Ave, the IDS Center, or MSP airport, there are just as many that feature places only a true Minnesotan would recognize: the Grain Belt sign, Augie’s, The Egg and I, Palmers Bar, the underside of Ford Bridge…the list is endless. As a film student, one often sees the same locations being used over and over, but the Twin Cities offers endless possibilities for directors, writers, actors, and film junkies. After all, we have four seasons, 10,000 lakes, “twin” cities, one of the largest suburban sprawls, a thriving arts community, and an (over? )abundance of hipsters. Location: MN, a weekend showcase of some of the great movies that put the Land of 10,000 Lakes on the cinematic map, recognizes and celebrates Minnesota, the film and arts community at large (including the MN Film Board), directors, writers, actors, and producers, and changes the way we experience not only our MN pride, but also how we experience the land/cityscapes and community that MN has to offer. So, we’re looking at you, community! We’ve carefully mapped all the notable filming locations from the 10 movies we’re showing next weekend (Purple Rain, Trauma, Factotum, A Simple Plan, Purple Haze, Northern Lights, Fargo, Snow, Mallrats, Sweetland) but we haven’t identified which film belongs to which location. We want you to use your collective knowledge and experience (especially if you worked on that film!) to add locations and films to our map. Where were the featured films shot? Were you an extra in any of these films? Did you watch the filming of any of these movies? Know of other films shot at these locations? Know locations of other films shot in MN? Do you film in MN? Where would you shoot your films? Where would you like to see a film shot? Then get outside and play SCVNGR. We’ve created two digital scavenger hunts using the mobile app SCVNGR: Location: MN Pub Crawl and Location: MN. The treks will take you around to various filming locations in Minneapolis (and one in Eden Prairie), where you’ll snap photos, answer questions, and earn the ultimate reward: a free ticket to any of the Location: MN screenings. 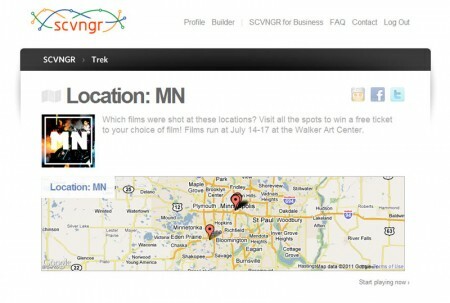 To find the treks from your mobile device, log in to SCVNGR and search for “Location: MN” under Treks. For each trek you complete, you’ll receive one free ticket to any of the Location: MN screenings. The full schedule of screenings is right here.